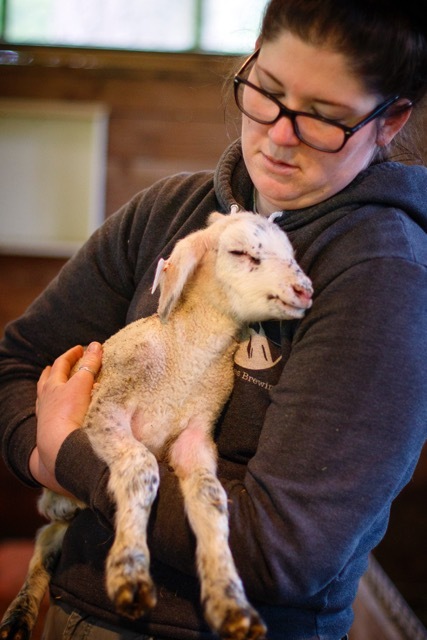 It’s springtime, and lambs are being born at the Glendale Shepherd dairy farm. 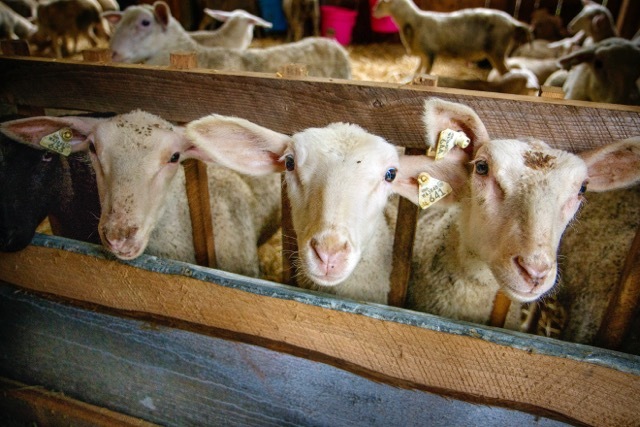 Their mamas, about 60 ewes, are milked twice a day to produce milk for yogurt, soft brebis frais, and hard cheese. 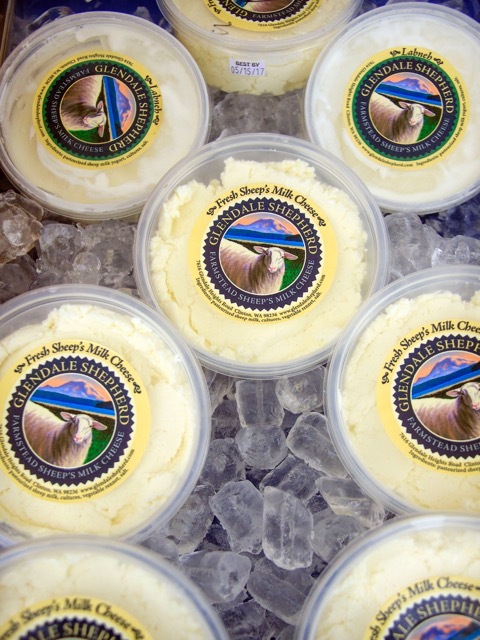 The ewes are a cross between European and North American breeds, and owners Lynn and Stan Swanson have been making award-winning cheese from their milk for the past five years. The family runs a Grade A dairy in Clinton and is committed to practicing sustainable agriculture with artisan sheep milk cheeses and pasture-raised lamb. With forest, pasture, ponds, and meadows, the farm provides a diverse landscape for livestock and wildlife alike. 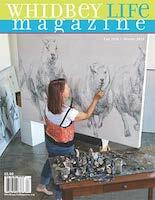 Lynn Swanson, also a talented clothing designer and sculptor, ran a summer horse camp for years before the couple became interested in making sheep milk cheese after buying the flock from another island artisan cheese maker nearly 10 years ago. These days, the Swansons are the only commercial cheese makers on the island. Lynn popped out of the super-clean kitchen, where she was preparing fresh yogurt and brebis frais, the soft cream-cheese-like pasteurized cheese sold locally at the Star Store in Langley, Bayleaf in Coupeville, and the Bayview Farmer’s Market. 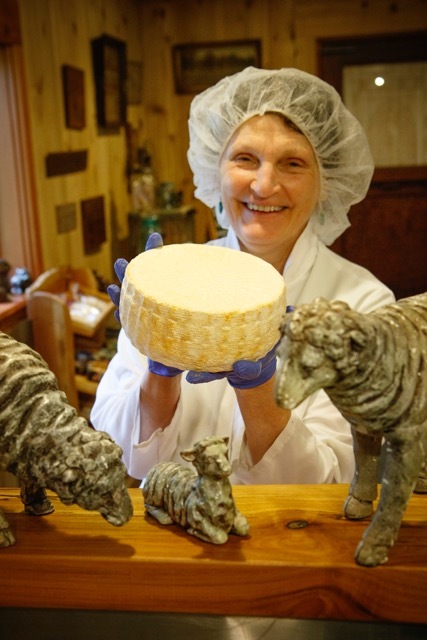 Lynn Swanson has won top awards for her sheep cheese varieties. (Photo by David Welton). 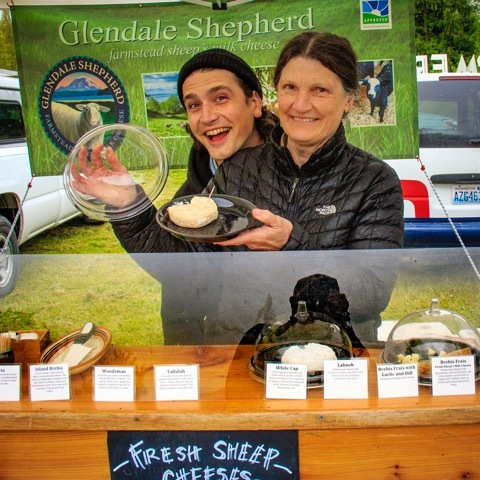 At the Ballard Farmer’s Market last Sunday, business was brisk at the Glendale Shepherd booth. Regulars such as chiropractor Gary Moskowitz stop by each week to return empty jars and buy new ones full of fresh yogurt. Moskowitz says he’s been coming by for years. He was greeted as a regular as he approached the counter. Back at the farm, Stan rods over to the barn where a newborn baby ram calls out. The newborn is nestled with other lambs in a bed of straw under a heat lamp. Lambs are separated from their mothers at birth and fed formula, a common practice in working dairies to minimize the stress of separation. Anna Magnuson, who once attended summer horse camp at the Swanson farm, now helps run the dairy business with the Swansons and their son Erik. Stan says there were about 120 lambs born this year. Some will be used for dairy and some for meat. All wear ear tags: right ears for rams and left ears for ewes. Holding the newborn ram with his short buds of wool and his long legs, Magnuson says he resembled his mama and grandma with their “freckles” of black dots sprinkled amid the white wool. Magnuson, Becca Shim, and Erik Swanson milk the ewes twice a day. This season is the first time she has helped midwife some of the lambs at birth. After about a month, the lambs graduate to “weaner” status, meaning they no longer need milk. They grow strong on their diet of organic hay from Wilbur Bishop’s Ebey Road Farm and their diet is supplemented by a special organic blend of grains made just for these sheep. The ewes are fed grain and allowed to go in the pasture for about an hour a day. They’ll graze more as the pasture dries up and is not so muddy. Over in the store and kitchen, Lynn finishes filling sterilized glass bottles with fresh yogurt. She points proudly to a wooden board, which announces that Glendale Shepherd’s Tallulah cheese took first place in 2016 at the Washington Artisan Cheese Festival. Tallulah is soft, ripened, has a creamy interior and a smooth, mild, and nutty flavor. The award joins many others displayed in the farm store. Chef Jess Dowdell runs the island’s gastropub Roaming Radish with her husband J.P., and as a farm-to-market food devotee, she gives high marks to Glendale Shepherd’s cheeses. Lynn Swanson says that she is in full compliance with the Food Safety Modernization Act, which requires certification and university classes to meet its strict standards. The legislation was a considerable reform of our nation’s food safety laws and was signed into law by President Obama on January 4, 2011. It aims to ensure that the U.S. food supply is safe by shifting the focus from responding to contamination to preventing it. The small farm has also earned an Animal Welfare Approved designation, meaning the animals are well-treated and cared for. Indeed, the sheep appear to be in a Zen state of mind. If you’re in Seattle, you’ll find the farm’s cheese, yogurt, and meat at the Ballard Farmer’s Market, University District Farmer’s Market, and Kurt Farm Shop. As for restaurants, you’ll find the cheese on the menu at Orchard Kitchen and Roaming Radish locally and at Bar Ferdinand, Salare, and Mkt. in Seattle. The farm store is open Sundays from 11 am to 4 pm. Farm tours are available by reservation. Kate Poss worked as a library assistant at the Langley Library until last June, when she retired. She worked for three summers as a chef aboard a small Alaskan tour boat from 2008 to 2010. She was a newspaper reporter in Los Angeles for many years before moving to Whidbey Island, where she likes cooking for new and old friends, hiking, reading great fiction, and writing her second novel with friend Fred Bixby. David Welton is a retired physician who has been a staff photographer for Whidbey Life Magazine since its early days. 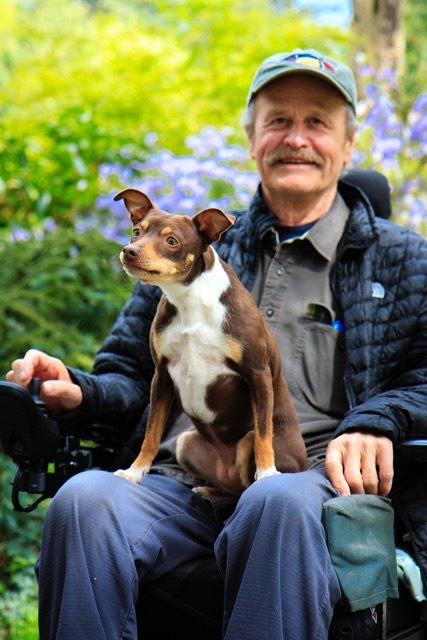 His work has also appeared in museums, art galleries, newspapers, regional and national magazines, books, non-profit publicity, and on the back of the Whidbey Sea-Tac shuttle!